Britain will allocate $61.2 million in humanitarian and non-lethal aid to Syrian rebels, the British prime minister’s office said in a statement. 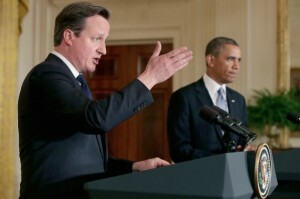 UK prime minister David Cameron met with US President Obama on Monday discussing the Syrian conflict following last week’s talks on the same issue with Russian President Vladimir Putin. “During a joint press conference with US President Barack Obama today, prime minister David Cameron announced that the UK would be providing an extra £30 million [$45.9 million] of humanitarian support for the victims of the Syria crisis,” said the statement. An additional £10 million ($15.3 million) in non-lethal support to strengthen the Syrian opposition, will also be provided to help reduce the effects of the conflict “spilling over into neighbouring countries and to support human rights and civil society,” added the statement. Syrian leader Bashar al-Assad has criticised the British government’s role in Syria. President Assad said in an interview with the Sunday Times two months ago that Britain played an “unconstructive role” in the region and accused the country of supplying Syrian militants with weapons. Diplomatic discussions on the Syrian conflict are set to continue this week, with President Putin due to hold talks in Russia with Israeli prime minister Benjamin Netanyahu, and US secretary of state John Kerry and Russian foreign minister Sergei Lavrov are expected to meet on the sidelines of the Arctic Council meeting in Sweden this week. Syria has been locked in an increasingly bloody civil war since demonstrations broke out against President Assad in March 2011. According to UN estimates, over 70,000 people have been killed in the conflict.